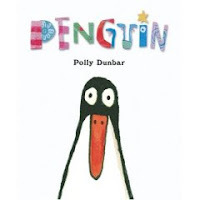 Penguin by Polly Dunbar. Read it and you'll see how it fits into the theme. It's super cute and surprising. Plus, penguins pretty much rock. I'm not sure preschoolers would really get it, but I think it would be great for kindergarteners and lower elementary school kids. It's a very simple story with cute, simple illustrations. I'd pair it with a couple of my new favorites: I'm the Biggest Thing in the Ocean by Kevin Sherry and Class Two at the Zoo by Julia Jarman. Throw in a little Ugly Fish by Kara LaReau and maybe the song "I'm Being Swallowed by a Boa Constrictor" and you've got yourself a storytime. These are all stories about animals eating other animals or people, but if you wanted to broaden it or turn it around, you could add the stories The Little Old Lady who Swallowed a Trout by Teri Sloat, My Little Sister Ate One Hare by Bill Grossman (a favorite of our 4- and 5-year-olds), or Too Many Pears by Jackie French. For younger kids, add The Very Hungry Caterpillar with puppets or felt pieces (there is a cute velcro set and a puppet available from Lakeshore Learning Store).